The Sanctuary Spa Little Luxuries Gift Set combines three nourishing body washes all enriched with sensual ingredients to leave skin feeling revived and purified. Utilising Jojoba beads, each formula transforms into a delicately perfumed foam which cocoons and cleanses. Housed in a gift box topped with a ribbon. Free from parabens and microbeads. A refreshing formula enriched with essential oils and gentle Jojoba beads. The weightless formula will leave the body feeling silky smooth and moisturised with a sensuous, floriental fragrance of Patchouli, Sandalwood and Jasmine. Free from parabens. An aromatic body wash infused with a delicate cocktail of Rose, Water Lily and Jojoba beads to leave skin feeling beautifully silky and purified. 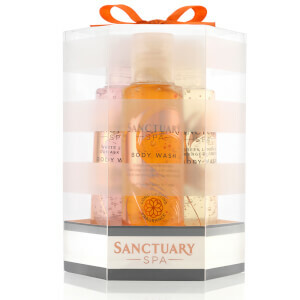 A vibrant and energising body cleanser powered by zesty notes of Orange Fruit Water and Lemon Oil. Enriched with Jojoba beads, the body wash envelops skin in a silky foam and delicately lifts away dirt and impurities to leave skin feeling fresh and clean. Classic: Aqua (Water), Sodium Laureth Sulfate, Glycerin, Acrylates/C10-30 Alkyl Acrylate Crosspolymer, PEG-40 Hydrogenated Castor Oil, Phenoxyethanol, Sodium Benzoate, Sodium Hydroxide, Parfum (Fragrance), Benzyl Alcohol, Butyl Methoxydibenzoylmethane, Propylene Glycol, Sesamum Indicum (Sesame) Seed Oil, Aluminum Starch Octenylsuccinate, Agar, Simmondsia Chinensis (Jojoba) Seed Oil, Tocopheryl Acetate, Chlorphenesin, Mica, Polyquaternium-39, Tin Oxide, Hexyl Cinnamal, Linalool, Limonene, Benzyl Salicylate, CI 73360 (Red 30 Lake), CI 15985 (Yellow 6), CI 77891 (Titanium Dioxide), CI 16035 (Red 40), CI 42090 (Blue 1). White Lily: Aqua (Water), Sodium Laureth Sulfate, Glycerin, Acrylates/C10-30 Alkyl Acrylate Crosspolymer, Phenoxyethanol, Sodium Benzoate, Sodium Hydroxide, Parfum (Fragrance), PEG-40 Hydrogenated Castor Oil, Benzyl Alcohol, Butyl Methoxydibenzoylmethane, Propylene Glycol, Aluminum Starch Octenylsuccinate, Agar, Simmondsia Chinensis (Jojoba) Seed Oil, Tocopheryl Acetate, Chlorphenesin, Mica, Polyquaternium-39, Hydrogenated Starch Hydrolysate, Panthenol, Tin Oxide, Bambusa Vulgaris (Bamboo) Extract, Nelumbo Nucifera (Lotus) Flower Extract, Nymphaea Alba (Water Lily) Flower Extract, Rosa Damascena (Rose) Flower Oil, Hexyl Cinnamal, Butylphenyl Methylpropional, Limonene, Linalool, Geraniol, CI 77891 (Titanium Dioxide), CI 17200 (Red 33), CI 42090 (Blue 1). Green Lemon: Aqua (Water), Sodium Laureth Sulfate, Glycerin, Acrylates/C10-30 Alkyl Acrylate Crosspolymer, Phenoxyethanol, Sodium Benzoate, Sodium Hydroxide, Parfum (Fragrance), PEG-40 Hydrogenated Castor Oil, Benzyl Alcohol, Butyl Methoxydibenzoylmethane, Propylene Glycol, Aluminum Starch Octenylsuccinate, Agar, Simmondsia Chinensis (Jojoba) Seed Oil, Tocopheryl Acetate, Citrus Aurantium Dulcis (Orange) Fruit Water, Citrus Limon (Lemon) Seed Oil, Chlorphenesin, Mica, Polyquaternium-39, Talc, Tin Oxide, Limonene, Citral, Linalool, CI 77492 (Iron Oxides), CI 77891 (Titanium Dioxide), CI 73360 (Red 30 Lake), CI15985 (Yellow 6), CI 19140 (Yellow 5).